Our ferrous metal cutting saw blades have been designed with a very durable C-6 carbide grade and triple chip tooth grind to ensure an extremely long cutting life in ferrous metals including: steel studs, rebar, angle iron, pipe, conduit, flat stock and much much more. In fact, these excellent metal cutting saw blades can also be used for cutting non ferrous metals such as: copper, brass and aluminum. The specifically formulated micro grain carbide tips with titanium and tantalum last much longer and leave a clean burr free cut with very little to no sparks or dust, which is very common with abrasives. 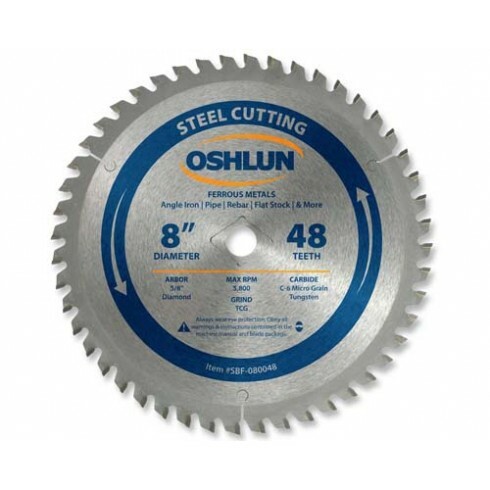 Our industrial grade metal cutting saw blades cut 5 to 10 times faster and up to 30 times longer than abrasives which allows for fewer saw blade changes and an increase in production. Try out these superior metal cutting saw blades today!